Can my Small Business File for Bankruptcy in Missouri? Home » Bankruptcy » Can my Small Business File for Bankruptcy in Missouri? People, of course, start small businesses with the hopes of financial success, though we all know that things do not always go as planned. Many businesses require a large amount of capital to start up, which often comes in the forms of business loans or other types of debts. If a business does not make substantial profits soon enough, the small business owner may be unable to pay back those debts. Many small business owners in trouble wonder if bankruptcy is an option for them. Bankruptcy is definitely available to business owners, but the specific type of bankruptcy you may file depends on certain characteristics of your business, such as the business entity. For example, if you have a sole proprietorship or a general partnership, you are personally liable for all of your business debts. This also means that you may not file for bankruptcy under the name of your business, but instead must file for personal bankruptcy. Personal bankruptcy may be filed under Chapter 7, Chapter 13, or under rare circumstances, Chapter 11. Chapter 11 bankruptcy is usually only a good option for people with particularly large amounts of secured or unsecured debt. If you have filed with the state and formed an LLP, LLC, or corporation, your business may usually file for bankruptcy under its own name. In these cases, a business may file for Chapter 7 or Chapter 11 bankruptcy, as Chapter 13 is not available for business entities. Chapter 7 will liquidate your small business and shut down operations, while a Chapter 11 bankruptcy will allow you to continue operations and simply reorganize your debt and get onto a payment plan. Therefore, which type of bankruptcy you file will depend on your future wishes for your small business. If you or your business is facing financial trouble, an experienced Missouri bankruptcy attorney can help you explore your many options for relief and choose the right one for you and your business. 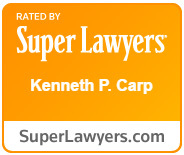 Attorney Kenneth P. Carp has helped many people get back on their feet, do please call our office today at 636-947-3600.